Shine a Light: "As If !!!!!!" We're in the tourist centre of Cairns in the Marlin Marina. We hadn't planned on being here until Sunday or Monday but ended up coming in after night fall on Saturday night. The reason for the 'early' entry and our first night time marina approach was the unbearable roll at anchor off Fitzroy Island. We had planned to stay a day or two at FI and take in some of the walks and maybe try out the resort's restaurant but, after anchoring and going ashore to have a cold beer and enjoy the feel of solid land under our feet, we returned to the boat to awful rolling. Honestly, it was almost impossible to walk around. Hopeless! After about 15 minutes of both of us trying to endure it quietly the Captain suddenly said, "we're leaving!". And we motored - FAST - for the leads to the Cairns channel. Going into a port for the first time in the half light of dusk takes concentration. Can I just say right now, "God Bless the Furuno Chart Plotter!". What an amazing piece of equipment it is. I can't imagine (well, I can and let's just say I wouldn't want to) trying to do this without it. 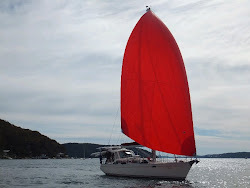 I was steering the boat at full speed - 8 knots and a bit - hurtling into the unknown with the plotter as my guide while the Captain was busy on deck getting the fenders and lines ready for the marina. Luckily - AGAIN - the crew on 'Whimaway', who we thought we had said a sad farewell to at Dunk Island, were here and with one phone call they were standing at our marina berth with a flashlight to guide us in through the dark. It was just on 6:30pm. God love & bless them! Tired, a bit stressed (me, definitely) and smelly from our marathon day on the water - up at 5:30am to leave Mourilyn Harbour and then another 2 hours from FI - we washed up quickly and joined Peter, Rob and Donna for a celebration of Donna's birthday at an Italian restaurant near by. Great night .. and we slept like logs for over 9 hours that night! The past couple of days we've walked all over the town exploring and last night hosted drinks on 'Southern Belle' for 'Whimaway' and Anne and Barry from 'Momentum'. This morning I was sitting on the back of the boat watching all the boats going in and out of the marina and feeling quite reflective. I'm amazed I'm here, on the boat, in Cairns! I recall when we started planning this trip that - during the months of putting everything together - I consistently wondered if I would make it. "AS IF, I would say to myself, I'll make it there!". The Captain was working a lot of the time which left me to collect the guide books and charts amongst other things. I remember looking at the new charts as I labelled and packed them into their sleeves and wondering if I would see the exotic places they hinted at. Places like the Hinchinbrook Channel, Cape Bowling Green and Magnetic Island. I did it - I've seen them all and we're pretty much at the end of the current set of charts and books. Now its time to buy more charts and more books for the Louisiades trip. New listings of exotic places in a new country. I must say I feel as apprehensive as I did earlier this year and then some but this time I know that I will make it there and back and eventually back to my home and dog in Sydney. The experiences we've had so far have been amazing! And the ones in the 'not so amazing' category make for good stories around sundowner drinks but don't stick in the mind as awful - just as events like the others. As I watched the boats in the harbour this morning I thought about each individual person on them. The boat loads of tourists - families and backpackers some from far away countries - going in and out headed for the reef .. What have been their experiences? The sailing boats down at our end of the marina - some big and expensive and some small and modest - with the couples on board who are mostly retired looking folk like us ... Where have they been and where are they going, I wonder. I guess all of us are fulfilling dreams or aspirations the best they can at this particular time. One thing I know with certainty is I'm so GRATEFUL that the Captain and I are so blessed to be able to do what we're doing. We'll be here for the remainder of the week and hope to catch up with our friend Tim soon. Then we'll move into the marina at Yorkeys Knob to prepare for the Louisiades Rally. More soon. Oh Gail, this is such a wonderful adventure!!! I relish your new posts and wish I was there. I will volunteer as a galley slave, poop deck scrubber, fisherwoman, cook, whatever! Just let me sleep on the stern in a warm bag under a dry cover! Or keep posting pics and details for me to savor!